It would be interesting to know the reason for this little gathering at the station. Anyone any suggestions? If it was taken in 1913 as stated , there won't be anyone still alive to help. I think that the photograph dates from about 1895 rather than 1913 although it may have been issued as a postcard later than that. The railway infrastructure looks very fresh and new suggesting an earlier date and this may be the reason the photograph was taken. 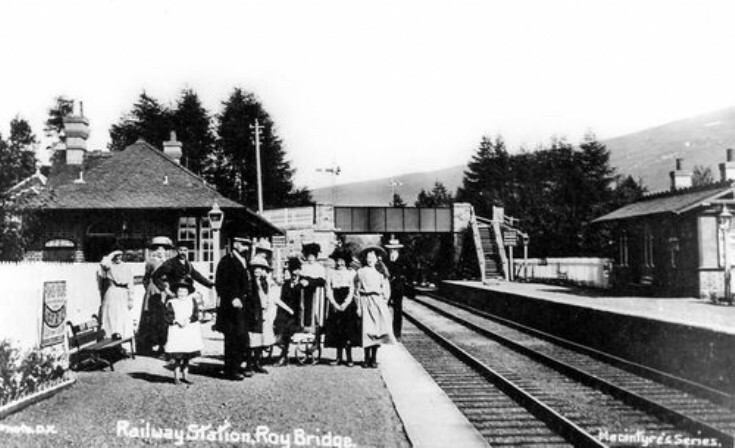 Similar photographs of groups on stations are common, the photographers probably realised that they were likely to be able to sell photographs to all the station staff and then sell the image on as a postcard to local shops or hotels, particularly when a railway was new. If the photograph was taken in 1895 then the figure in uniform in the foreground is the Stationmaster John McLennan, my great grandfather. There is a larger copy of the picture available in a book and comparing it to family photographs both my mother and I recognise a likeness in the lady second from left to my great grandmother. The girl standing beside the Stationmaster appears to be related to him as they are standing so close and is probably their daughter and the two girls in the right foreground are likely to be their daughters as well, which would fit their family at the time. The other male figure in uniform looks like the porter and the other two may be the booking clerks.